Fernie is an excellent skiing destination, with a long season and high snowfall, there are many options for most of late fall to late spring. There are several huts in the area and many excellent tours into high alpine terrain. Weather tends to be fairly predictable and is quite pleasant especially later in the season. Fernie alpine resort offers several excellent options for lift assisted backcountry skiing, just keep in mind that once you cross a boundary the resort patrol is no longer responsible for anything you do, you are on your own. Due to the nature of the microclimate in Fernie, it is a good idea to get information on the snowpack from locals or ski patrol as it can vary quite significantly locally. The first two routes listed below are provided by Mike and the third one by Terry Wallace, both regular Backcountry Skiing Canada visitors. If we have missed anything please let us know? For a full listing of backcountry huts, cabins and lodges in the Rockies check out the Rocky Mountain cabins/huts/lodges page over here. 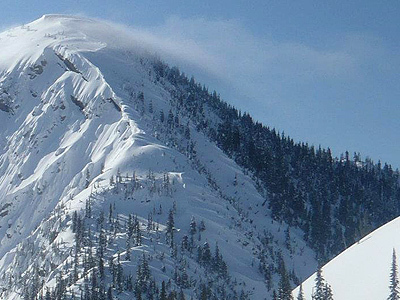 Mongolia Ridge can be viewed on your right when skiing Falling Star in Siberia Bowl at Fernie Alpine Resort. The up track is typically already set with numerous switchbacks to make the going easier. Make sure to avoid any exposure to avalanche hazard by staying on the inside edge of the trees. Climb to the saddle and then to the ridge on your left and drop in anywhere in the trees on the northwest facing slope. This route will dump you back out right on Falling Star. You can also drop in heading away from the resort and you will eventually end up on the lower cross country trail loop. From here it is an easy ski-skate northwest back to Fernie Alpine Resort. ACCESS: Access it by cutting all the way across Falling Star from the top of the Timber Chair at Fernie Alpine Resort. There will be a Ski Area Boundary sign where you can start climbing. A quick boot pack up Lost boys Pass about 10 minutes and you can put your skis back on and make a short traverse down the S/SE facing slope. You will cross one main north facing avalanche path once you are at the bottom of the first traverse. From here the skin track leads up making switch backs through the well covered trees. Once the trees start to thin out you will crest onto the main ridgeline. The rest then becomes a relatively easy skin to the top with only a few easy switch backs. Excellent 360 views await at the top. Once at the top there are a few options, you can ski the north facing trees back down to where the skin track started or you can go for the bigger lines on the NW facing slope. You can also ski the ridge along the NW slope which is full of interesting wind features. ACCESS: At the top of the White Pass chair at Fernie, head to your left down Falling Star until you see Lost Boys Pass on your right, there is a big sign warning you that you are leaving the patrolled area. This area is host to a variety of skiing with endless options. I would say that there is something there for all skill levels. This is a very straightforward hike that does not see an abundance of traffic. As usual though with any backcountry route, if you do not feel comfortable with your surroundings or if you are unprepared DO NOT attempt the hike or go beyond your comfort level. The route does require avalanche knowledge and route finding skills. The entire hike to the cabin is within the tree line so safe routes are always possible. Last season 2011-2012 we made it to the cabin on a HIGH CAA avalanche-rating day with no issues. We used our experience, skills and knowledge to so safely. I would not recommend anyone going out in those conditions unless experienced and knowledgeable. The climb is roughly 800m vertical and climbs from the road, fairly gradually up a gulley (Tunnel Creek) along an old logging road. The logging road is fairly straight until a switch back. You make the switch back and then not long after that (1-200m distance) the road switch backs again. You will carry on and when you hit the next switch back you veer off the road and into the woods continuing straight up the creek (at this point you will get off the logging road and begin your own trail). The trail follows the creek and then begins to wander. You will come to your first meadow/flat area. After this meadow area you will encounter your first climb, fairly steep for about 50m vertical. You can choose various routes up depending on your comfort level. Lots of trees provide good protection. The climb then begins to flatten of and you carry on your way. You will approach a larger ridge directly in front of you. It will be steep and large. You will then have to turn to your right and begin to switch back up another 50m vertical or so until it flattens off. This will be another meadow area. In this area there is a cabin. The cabin is rented out through the Guides Hut in Fernie. The hut may be the end of your journey or maybe just your staging area for great skiing. If you are just going to the cabin and turn around, skiing back down to the parking lot is fast and enjoyable as there are few flat areas and the grade is consistent. This hike has a few starting points that I know of. This start point is the most straightforward and popular. 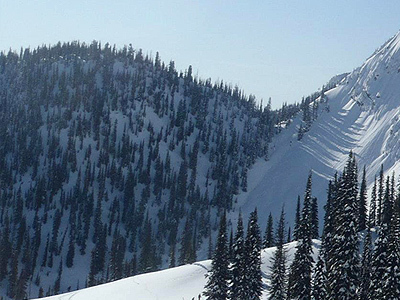 I have heard of people who tour from the Fernie ski hill. I am not sure how far it is and the elevation changes but I know I have looked in that direction from the hill and it would require a lot more preparation and planning than the above option I have mentioned. 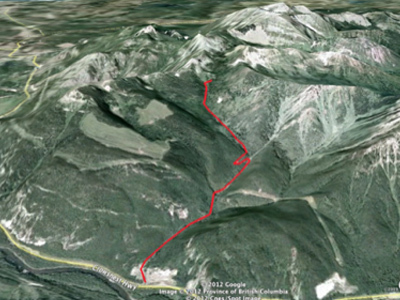 ACCESS: 20 km south of Fernie on HWY 3 there is a gravel pit that is gated off during winter months. In the springtime the gate is opened and the area is accessible by sled. The winter moths it is a non-motorized area. The gravel pit is where you park and start your climb.